The 2018 Sagebrush Sentinel Award is being presented to environmental attorney Dave Becker, a Portland-based lawyer whose business card succinctly summarizes his work as “Cows, Fish, and Wind.” Dave has racked up formidable legal victories in these areas, and his appearance on a lawsuit sends shivers down the spine of public lands ranchers, energy developers, and federal agencies across the west. Western Watersheds Project gives the Sagebrush Sentinel Award to an environmental advocate whose feisty commitment to environmental protection and whose dedication to the vision of healthy watersheds and wildlife habitats is an inspiration to us all. 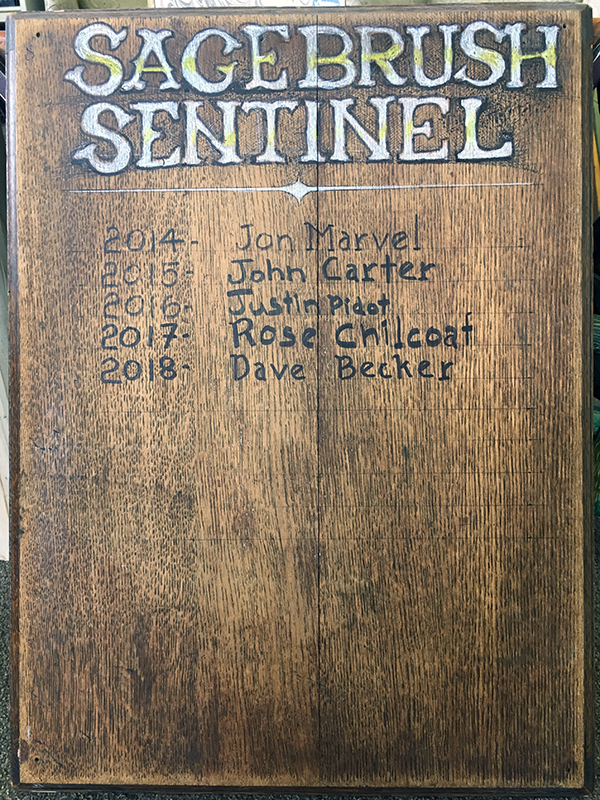 The Sagebrush Sentinel Award was established in 2014 in honor of Jon Marvel, the founding director of Western Watersheds Project, and it is now given annually to someone whose work embodies the tenacity and grit for which our organization is known. This year, we’re giving it to Dave, a long-time friend, supporter, and ally of WWP. After graduating from Cornell Law School and clerking for a Second Circuit judge, Dave entered private practice in the New York area. After a few years, he felt a different calling and moved west to attend a specialized degree program at Lewis and Clark Law School and transition into public interest environmental law. While still in school, he argued a case for the Oregon Natural Desert Association (ONDA) before the Ninth Circuit that became a precedent-setting victory allowing groups to challenge the Forest Service’s annual grazing instructions—not just 10-year term permits—in court. After a stint with Western Resource Advocates in Utah fighting coal power plants, he joined the legal team at ONDA. There he led a legal campaign to halt an industrial wind facility and transmission line proposed on Steens Mountain—a campaign that was ultimately successful in keeping Steens Mountain wild and free. Also at ONDA, he litigated and won a complex challenge to grazing in steelhead and bull trout habitat on the Malheur National Forest. He also helped with ONDA’s and WWP’s long-running series of challenges to BLM’s grazing plans in the Louse Canyon area, a half-million acre landscape in core sage-grouse habitat in the upper West Little Owyhee River country deep in southeastern Oregon. In 2011, Dave hung his own shingle and has since represented WWP on several key cases. This includes our current challenges to grazing decisions in central Idaho’s Copper Basin and to the grazing occurring on the Klamath Basin Wildlife Refuges, as well as several other cases in Oregon to protect native fish and frogs. Dave has been unfailingly supportive of WWP’s legal efforts, often offering insight and suggestions even on cases he’s not getting paid for. We’re incredibly grateful for his generosity and support. In addition to his top-notch legal skills, Dave has a wickedly dry sense of humor reminiscent of none other than the founder of WWP. It is our true honor to have him on our side!